Our golf course overlays an ancient landscape where the physical evidence of human occupation of the land, for over 4,000 years, can still be clearly seen. Hockley was covered in forest until the Bronze Age (2,000 BC) when the nomadic hunter gatherer people began to settle the landscape with modest cultivation. The first major settlement of Winchester occurred in the fields to the right of the 15th through to the 18th holes and almost certainly the Bronze Age Village covered parts of these fairways. In those days the plough just broke the soil and the fields would have been ploughed one way and then again at right angles to prepare the ground for seeding. The picture at left shows an excavated grain silo - these were dug into the chalk filled with grain and capped with clay. This example was excavated in the field beside the 17th. Even in an undulating landscape the most efficient shape was square and over thousands of years the soil eroded from the top of each plot to the bottom creating huge earth banks. You can see the evidence of these Celtic Fields and field banks all over the golf course, the best ones are on the left of the 2nd, on the left of the 4th and across the 18th, and to the right of the 18th. Other banks cross the 7th and another on the 13th, with many others hidden by scrub. 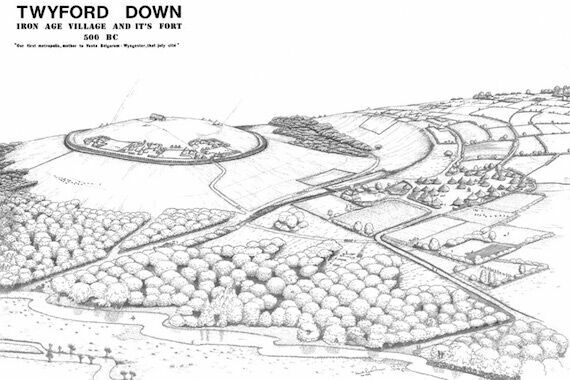 The Bronze Age village carried on being occupied through the Iron Age (500 BC) but as population began to rise then so did the conflict, resulting in the construction of Iron Age Hill Forts all over Southern England like the one at St. Catherine’s Hill. However Roman occupation chose to settle on the West side of the River Itchen, leaving the original pre-historic village and its field systems abandoned but intact. As Roman Winchester grew a significant Roman decided to build a villa outside of the town and he chose a spot with excellent views, the remains of that villa along with its mosaic floors lies under the 9th green. The double ditch and banks just short of the 9th are all that remains of the fortification protecting the villa. You first come across these remains as undulations directly in front of the 7th green and if you follow them to the left you can see where they turn the corner in the rough just before the 11th fairway. Over the years numerous Roman artefacts have been found around the 9th green including Mosaic tiles, coins, shards of pottery, knives, nails and bricks along with both animal and human remains. Elsewhere on the course an Iron Age plough, Medieval, Roman and Iron Age brooches, Roman coins and Roman pottery have been found. (The whole of the above area is one of two designated 'Scheduled Ancient Monument' areas that cover large parts of the Hockley estate - and the Club is proud to maintain it's duties under these responsibilities). For many years it was believed that the ditch in front of the 15th green was part of a much later period caused by sheep drovers roads or tracks however there is another theory to be explored shortly that this ditch is in fact the remains of a Roman track which ran from the Roman Road as it emerges out of Winchester on its way to Portchester, to the Villa site under the 9th. It is certainly ancient but if it were a sheep track way the eroded soil would have spilt out across the valley just beyond the 4th tee. However it has become clear that the soil taken out from in front of the 15th was carefully placed as an earth causeway in front of the 4th tee, this cut and fill resulted in a more level route from Roman Winchester across to the villa. This ancient feature and many other residual earthworks on the golf course have yet to be fully explored. About this time the design of the plough changed to being able to turn the more heavy and fertile soils resulting in improvements in crop production. This meant that the chalk soils, being so infertile, were abandoned for crop growing, giving way to sheep that were grazed in vast numbers across the Chalk Downs of Southern England. Wool became a major contributor to our economy and Winchester was an important centre for collection and export out through Ports, like the one at Botley, in Medieval times. Today we can still see evidence of sheep movement in the form of eroded sheep track ways crossing this part of the Downs on their way to Winchester. The remains of these track ways can first be seen as parallel undulations in front of the 6th green and then again in front of the 7th, the 12th and the 13th tees. In places they are up to 1 meter deep but beside the M3 they are massive, reaching 4-5 meters deep.